January was National Soup Month, and consumers across the country had a new fresh option as Walmart unveiled Marketside soups in its deli department. The new product launch is part of the retail giant’s plan to grow its overall deli sales by tapping into the heightened demand of consumers seeking easy lunch and dinner options without compromising on freshness or price. Blakeman said Walmart continues to expand its line of Marketside products, which are produced by a number of private brand suppliers that sell everything from bags of fresh spinach to fresh guacamole dips and salsas to sub sandwiches and wraps assembled daily in the retailer’s deli department. Statista reports the U.S. soup market is valued at roughly $6.9 billion. Growth in the category has been stagnant in recent years as consumers have sought out fresher foods with less sodium and preservatives that are found in many shelf-stable soups options. Walmart is betting consumers who have shied away from canned soup in recent years will likely try the fresh soup varieties which can be reheated quickly. The soups can stand on their own as a meal option. The cost is $2.87 for two servings or $4.97 for four servings. Walmart is not the first grocery retailer to launch its own line of fresh soups. Kroger’s Wholesome@Home fresh soups were developed two years ago by culinary chefs and are made fresh and never frozen. Texas-based H-E-B has been offering its own brand of fresh soups for several years. H-E-B also offers a few organic varieties of the fresh soup sold in its deli departments. Retailers like Walmart continue to try and take market share away from traditional soup companies like Campbell Soup Co.; ConAgra Foods’ Healthy Choice soups; General Mills, which owns Progresso; and Unilever, which owns Lipton and Knorr. While retailers are delving into the fresh soup arena, canned and dry soup manufacturers are working vehemently to hold their share. A report from Technavio in mid-2018 states there has been an increase in demand for instant, ready-to-serve, microwavable and canned soups. The concept of cold soups has also aided market growth with the availability of chilled and frozen soups. Packaged soups, both dry and wet, can be consumed with minimal preparation. Being a complete dish with healthy ingredients, soups are largely preferred by health-conscious consumers. The convenience factor associated with ready-to-eat soup increases the volume consumption of these products. The Technavio report predicts the category will grow sales in 2019 by 1% after being stagnant since 2016. A comprehensive consumer report compiled by Nielsen in June 2018 states the lines between categories, channels and brands continues to blur. Walmart launched a new line of fresh soups in January under its private brand Marketside. Tavolieri said consumers are turning to fresh foods in more of those moments. Americans have spent nearly $178 billion on fresh foods this past year, he added. Nielsen reports fresh categories drove nearly 49% of all dollar growth in 2018. Tavolieri said fresh ingredients have been the starting point for category reinvigoration underway today. Nielsen said retailers like Walmart can unlock and analyze the true potential across bakery, deli, produce, seafood and meat departments because consumers don’t shop departments, they shop needs. The Nielsen report found deli department sales across the retail industry drove highest level of growth in the fresh category. Deli sales were $32.7 billion of the $178 billion of fresh food sales last year. Deli sales rose 2.8% year-over-year, as 7.3 billion more items were sold than in prior year. Soups were a big reason deli sales increased year-over-year. Nielsen reported ready-to-eat soups grew sales by 16.5% in 2018, making it one of the hottest products. Ready-to-eat stew had the largest growth spurt in 2018, with sales rising 40.6% from the prior year. Nielsen found meal kits sold in the deli department are also popular with consumers looking for easy meal solutions. This category saw a 26.8% jump in sales last year. As Keto and other gluten-free diets continue to be popular with consumers, deli sandwiches saw sales drop last year, according to Nielsen. Sales of pork sandwiches declined 14.4%, while cold cut sandwiches fell 4.4%. Tuna sandwich sales also declined by 7.5% from the prior year. Looking specifically at ready-to-eat soup, Nielsen found grocery-aisle sales totaled about $1.73 billion, up 0.9% from the prior year. Soups sold in the deli had sales of $544.6 million, up 16.5% from the prior year. Meanwhile, frozen soup sales rose 18.3%, albeit from a smaller base of $33.9 million. 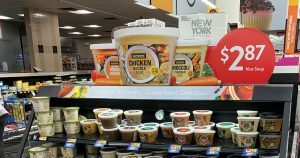 Nielsen said consumers are starting to look beyond the grocery aisles for their soup needs with over $1 of every $4 spent on ready-to-eat soups occurring within the deli perimeter of the store. Nielsen said ready-to-eat deli soups are valued at over $500 million and are seeing double-digit growth over 16% compared to last year. That’s why many retailers are either entering or expanding their ready-to-eat, fresh soup offerings.